On the northern side of Helliwell is a second-growth deciduous forest with a coniferous overstory. In areas associated with conifers, I noticed the sword ferns were healthy. But in areas of alder or big leaf maple, fern growth was sparse; grasses and sedges dominated. There were barren areas under shade where ferns may once have been. Perhaps the soil was too soggy, although ferns normally grow on the edges of bogs, and their spores spread via water. It is impossible to know exactly what is going on deep within the roots of the forest soil community. If vast numbers of ferns are dying, is it due to exposure, soils, or something more mysterious like an unknown disease embedded in the microbes of the roots? Could the ferns be dying because the roots of maple, alder, and cottonwood are also dying? Unknown causes? Someone needs to examine the interconnectedness of the roots and life in the mycelium to understand what is happening. One summer afternoon, I walked through Lord Hill and looked for signs of more die-off. Instead, I saw new fronds sprouting from huge mounds of dead fronds, small in number but showing that life returned. The mounds did not die, but rested. I wanted to know why. Sword ferns are ancient. Sword ferns have had a very long run. The fossil record of fern-like plants starts almost 400 million years ago, and they are still with us today. While the sword fern’s exact ancestry is unclear, it appears to be descended from the prehistoric class Coenopteridopsida, which is in turn descended from Trimerophytopsida. Sword fern fronds are comprised of simple, alternate leaflets, or pinnae. Their leaflets are finely serrated and have clusters of brown spore cases, called sori, on their undersides. 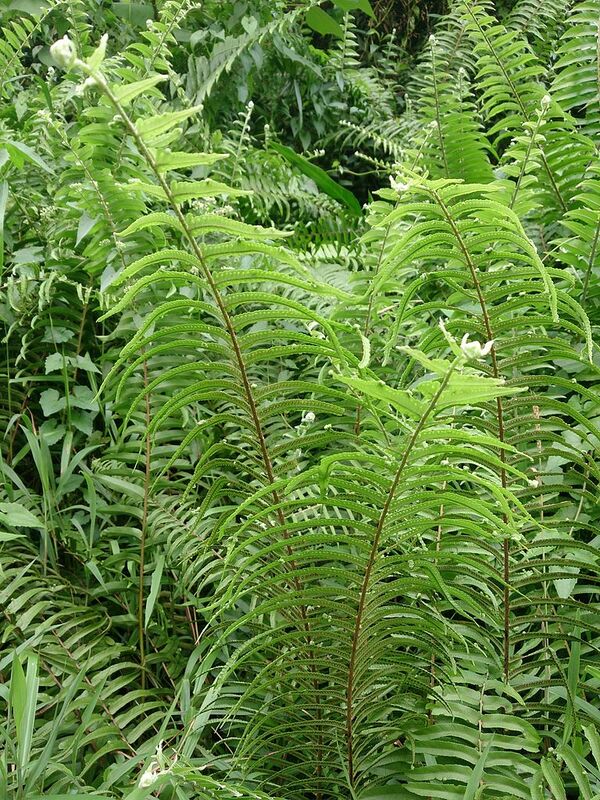 There are thirty-two and sixty-four sori on each frond. Sword ferns have a spiritual significance. Recently, I met a spiritual healer in Mexico who rubbed my feet, traced my veins, and instructed me to plant sword ferns around my house. In Spanish, she said “plant ferns under the window so that wild spirits do not come into your dreams at night.” Each morning, I look outside to see sunlight emitting from the core of a fern, somewhere deep within the plant. That’s when I think of her, Elizabeth, instructing me in Spanish to plant ferns for protection from wild spirits. I did not interrupt to tell her that I had already planted a hundred ferns, that I am already protected by good forest spirits. Instead, I listened to her vision of my past and future lives. In the coming years, I’ll salvage and plant more ferns under the back window. If ferns are what protects me, a few more won’t hurt. The work of salvage. Each spring, I walk around my yard brushing aside fallen, decomposing maple leaves to uncover a fresh, tender fern sending up new fronds, bright with life. Was this one I rescued trailside from hundreds of trampling feet? Probably. On walks through woods and logging areas, I cannot resist rescuing ferns. I’ve come across many that are trampled, gasping at life, shooting up one last frond, so close to death. Hikers, a careless bunch, widen trails with bicycles and walk side by side, enlarging the path. Ferns, once rooted, can’t move aside, so they face certain death if they are not salvaged. I’ve never removed a healthy fern, just the poor souls left to die along the edges of hard-worn trails. In fall, winter, and spring, I’ll gently tug at a crown of brown, hardened shoots; sometimes a few frail roots remain. Most come without resistance from the damp soil, as if they have lost their will to live. If the fern roots hold tight, it is not yet time to go. If loosened, I’ll place them in a plastic sack mixed with soil and water to keep them damp on the ride home. Once home, I plant them in black nursery pots, watering through the summer. In the fall, I’ll arrange them around the yard, gathering dead leaves and wood chips around the base to provide nutrients to the roots. There they rest until spring, when life returns. The significance of their roots. Recent forest studies reveal that a forest is not just the trunk, the branches, and the leaves; a forest includes the ecosystem below ground, too. It is every molecule, germ, and cell within the soil, the roots, the centuries of dead bug carcasses, the mycelium that sends chemical signals between the roots; joining, communicating, protecting the uppermost layer of earth. Soil is composed of the millions of microbes that process the dead bugs and dying leaves that fall from the sky. Every tree in a forest begins as a seed, grows roots to eventually hold together the earth, the river, and the shoreline. Without these interconnected roots, I imagine the world would fall apart. The beauty of sword ferns. The sword fern is my most favorite plant, with its long, evergreen fronds, alternate pinnatifid with sori seed packets stored underside. There is no more beautiful, hardworking, or resilient fern than the sword fern. They line roadsides, hillsides, riversides. They thrive in dense Pacific Northwest Douglas fir understory, as well as in recent clear cuts, where they shoot up new fronds, grateful for the new light. They endure trampling from forestry machines, then bravely re-sprout after the machines are gone. Their leathery fronds hold their shape through all seasons, unlike meeker relatives such as the deer fern, lady fern, or bracken fern who retreat back to the soil when the summer ends. In the hottest days of August, when their spores ripen, a walk through a forest will have you breathing in the microscopic spores, the red forest dust coating your pants, neck, and face. This is an ancient process taking place on your body. Helping their reproduction. Instead of salvaging ferns dying or abandoned ferns, I could collect fern spores from July to late August. I’d gather a few fronds and shake them in a paper bag. Then, at home, I’d sprinkle the microscopic dust spores onto a bed of moistened potting soil, cover with plastic wrap, and place in a shaded but not completely dark location with a temperature between fifty-nine and eighty-six degrees Fahrenheit. After several weeks, flat, heart-shaped discs, called gametophytes, would hopefully appear. A few weeks later, tiny fern fronds would sprout from the gametophyte, eventually withering and dying as the fern established itself independently. Each gametophyte would produce male and female reproductive structures. The male structures are called antheridia, and they produce sperm that move by means of flagella. The female structures are called archegonia. Each archegonium produces an egg, which is fertilized by sperms from the same or other plants. This fertilized egg, a zygote, would develop into the sporophyte—what we think of as the actual fern plant. These young ferns could then be transplanted to individual containers, eventually moved into the garden, joined with their parent plants. Sword ferns are introverts. My sword ferns love the shade, these introverts managing quietly among the flamboyant columbines, calendula, and foxgloves who effortlessly spread their seeds by the wind, casting their spirits far and wide. My ferns are content within their place, finding simple joy, never demanding attention or praise. They thrive near deciduous shrubs like mock orange, Indian plum, and Pacific ninebark, whose leaves drop each fall to enrich the soil. Their salvaged brethren are tucked under tall bushes and dark corners throughout my untidy shade garden. Sword ferns contribute to an untidy garden. In my untidy native garden, dead fern fronds lay gently upon the soil, enriching, protecting, and hiding numerous spiders, beetles, and mites who take comfort in secret hiding places beneath the fronds. The expired fronds of last year bring life to the soil, eventually becoming the soil. Some say it is best to trim these brown fronds, remove them from the plant. I disagree. What is a garden if not a messy refuge from concrete in our urban world? We’ve already paved, logged, and built over much of nature; can we call a truce with a small patch of earth and allow nature space to breathe? With dead fronds littering the ground, my yard is an oasis for bees who collect pollen in spring, cover for the chickadees, juncos, and thrushes who seek out nesting spots, and for hummingbirds eager to guard their territory. This year, an evening grosbeak sang his drunken melody from the crown of a conifer; I’ve enjoyed every note. My dying fern fronds and street-side dandelions remain long after neighbors have come and gone. A neighbor once referred to my yard as jungle, as she instructed me how to clear dandelions. When she left, I did not miss her. They teach us to avoid needless cutting. Horticulturists are in the business of tidying up yards and gardens, appealing to our sensibilities inherited from the rules of the English garden. Horticulturists instruct gardeners to cut fern fronds in early spring, before the fresh, delicate green fronds unfurl from a winter sleep. They say it looks “nicer” to remove the brown, dead fronds before the new growth appears. But, with the fronds removed, the crown has no protection from wind, rain, and sun. Where is the frost protection? Where can a beetle hide to protect it from hungry towhees? 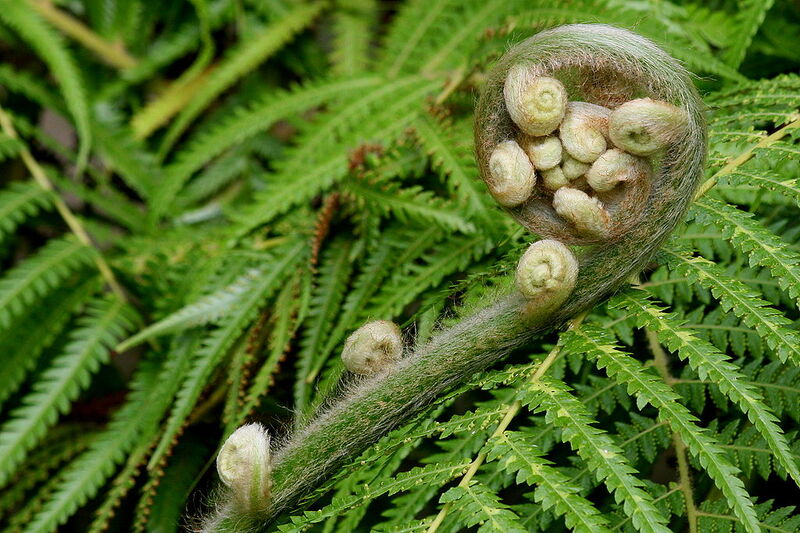 Wouldn’t it be better to leave fronds attached until the new fronds have completely unfurled, at least? Why, for the love of a beautiful set of fronds, would anyone cut them back to the brown, humped root crown before the new fronds have appeared? I know of no forest horticulturist that cleans dying fronds from the forest floor. If the forest can recycle its fronds into soil, then I, too, can live with my dying fronds. Rescuing each other. In the winter of 2004, on a chilly February day, a botanist friend and I first salvaged a couple dozen ferns from a ravine in Mukilteo that would soon be cleared for homes. I had bought my first home surrounded by a barren lawn, the trees long past removed. I would turn this empty place into a native garden, starting with sword ferns. Digging in the soft ground, we filled a wheelbarrow with mature, beautiful ferns in danger of eviction from their home by machines. For the ride home, I placed ten mature ferns in white buckets of moistened native soil. At home, I carefully arranged them in the sea of lawn, to see them from the back windows. A few survived this journey and now lay entwined under the shade of a young Douglas fir, where its roots have welcomed them, and together, we have thrived. 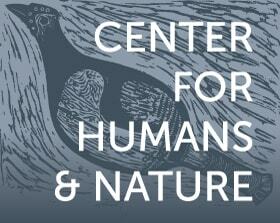 Acknowledgments: A version of this essay appeared in the Washington Native Plant Society Blog.